VIEW! PH 2 level townhome. Wonderful 2 Bdrm plus Den & 2 BALCONIES. Large Mstrbdrm, great windows, large closet and gorgeous ensuite bthrm with deep soaker tub. 2nd bthrm has dbl shower. Great kitchen with Granite, Gas Stove & stainless appliances. South facing balc off kit is great for BBQ's & overlooks residential homes. LR & DR have Maple H/W flrs & gas F/P. 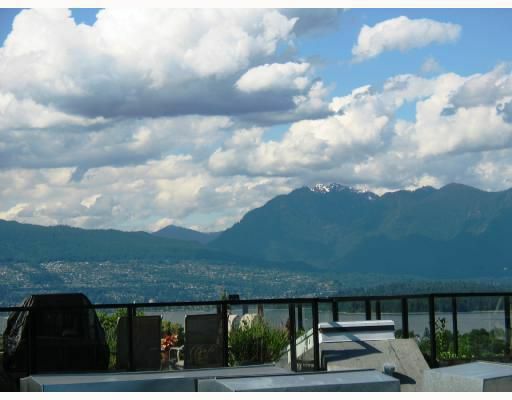 2nd Balcony off LR has Fantastic View of Ocean & Snowcapped Mtns-perfect for enjoying sunsets & warm leisure evenings. 2003 Rainscreened Bldg w/brick & Hardiboard ext. still under warr. Pets & Rentals ok. Steps to shops & restaurants.